Well another baseball/softball season has come and gone. It was a little bit more insane, well umm crazy, then last year. With two kids playing, it felt like it was run, run, run. I most definitely would not have traded it for the world. I am so blessed to have three healthy kids that can play all the sports and enjoy them. Of course at the beginning, Savannah wasn't all that coordinated, but her improvement was amazing. 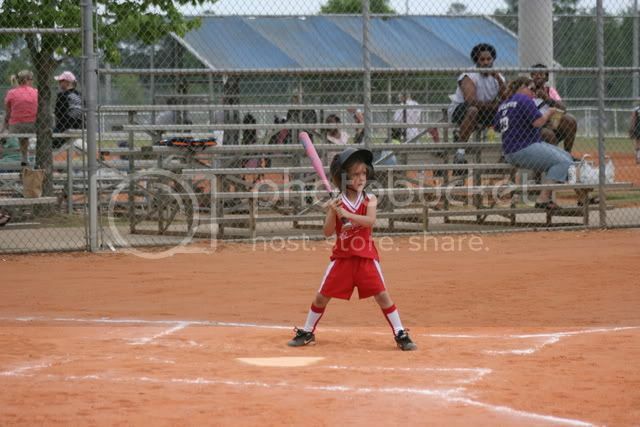 She now hits the ball everytime, can almost catch a pop fly, and knows exactly what to do in every position on the field. She has turned into a full blown baller, a softballer, but still nonetheless a baller :) She is finally so comfortable throwing and catching, she doesnt look at all like all she wanted to ever do was cheerlead (not that cheering is a bad thing, just not a good idea with my family LOL). JT developed into quite the player himself this year. It is absolutely amazing to watch children grow and change not only from year to year, but from the beginning to the end of a season. We were so blessed to have wondeful coaches who took great care of each and everyone of those little guys. It will be nice knowing that he will have at least one if not two of the same coaches next year. His confidence in himself and exploded and he can now face many situations that would have terrified him a year ago. 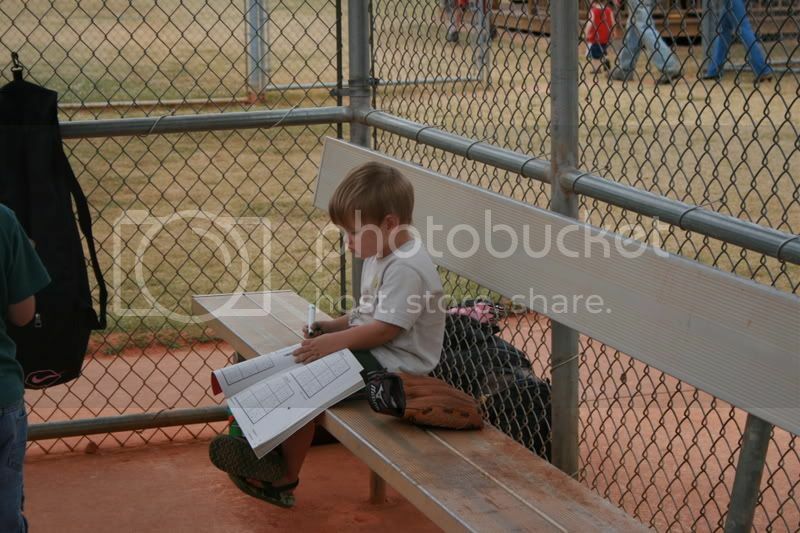 Now poor little Jake learned over this season to have patience and to enjoy himself and his sudoku books LOL. Now that baseball is over, we are looking for a short little break until ummm, well July LOL. Yep a month and a half off is all!!!!!! YIKES!!!!! Then it is back to the fun Georgia heat and some more balling for JT. So I said I was going to try and blog everday, but it seems it is all I can do to sit down for a few minutes. But well today I have a minute. So it was a busy week. We had, of course, baseball and softball. 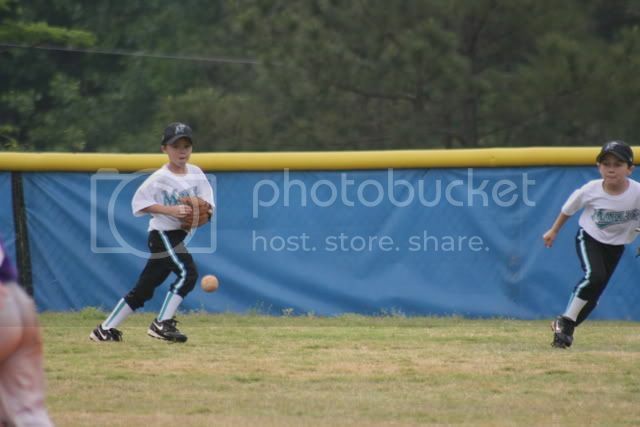 JT won his game on Thursday and Savannah did awesome at hers. You can most definitely tell that she is playing with the boys all the time. 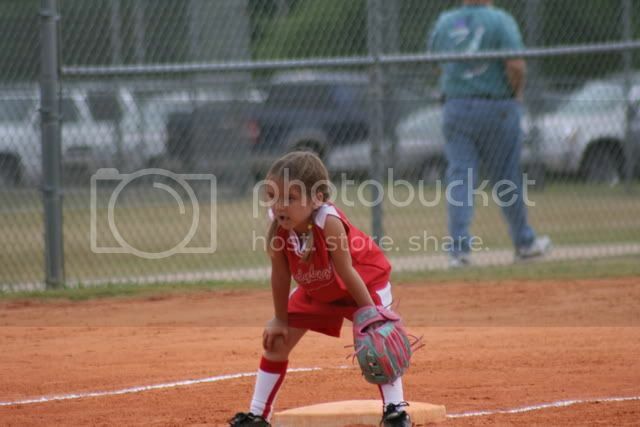 She was playing on second base and sure enough she got the ball. Well, the girl beat her to second, but kept on going and then turned back. Everyone is yelling at Savannah to tag her, so she does. Not only does she tag her, but she pretty much punches her with the ball. Everyone in the crowd chuckles and thinks it is so cute. Well I am sitting there thinking "Oh man, we will have to talk about that one. " So into the dugout she comes (I am dugout mom , so I am there also) and I tell her hang on. 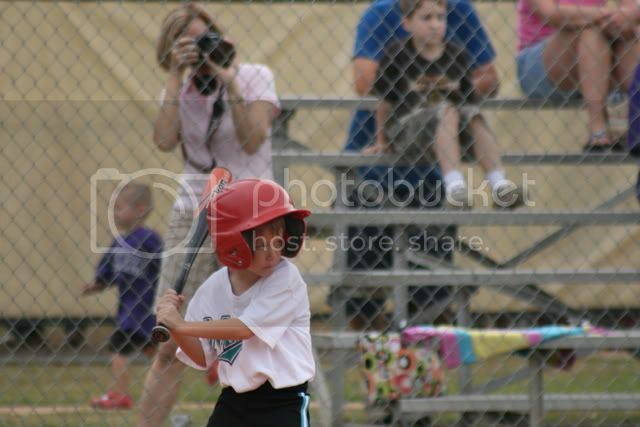 I said, "That was an awesome tag Nan, but next time try not to hit her so hard." She responds with, "But Mom, that is how the boys told me to tag someone!" So I had to explain that when she plays with the boys, she can act like a boy but while with girls she had to be a little more careful. Sometime playing with boys 24/7 is not such a good thing. JT had another game today and we beat the rain!!!! He played really well. He got a hit everytime. His uniform is very dirty today though. 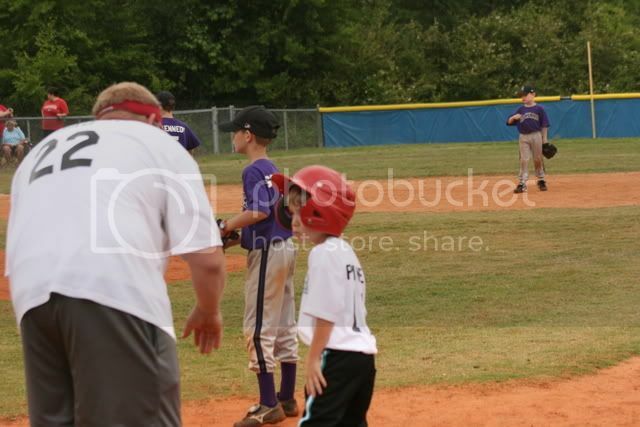 He decided that while running to first, he would try and eat some red dirt LOL. His coach told him he just needed to watch out of the dirt monsters because that little boy sure went flying!!!! So of course he was out at first LOL. He is really improving all the time. It must be because he pretty much eats, breaths and sleeps baseball. I sometimes wonder if it is us pushing him, but it really isn't. We have been trying to get them to STOP playing baseball and all they want to do all day long is play ball. I am sure by the end of next year we will have at least one broken window. The roof may have a good grove going down it from the constant thump and roll of the ball. At least I know all my kids are outside and safe when I hear the constant "Thump, Thump, SMACK (into the side of the house from Jake)" Then "OH Man I missed, Almost or WOOOOHOOO Good Catch"
Josh is on 24 hour duty today (First time in a LOOONG time). He has no privates to watch, so he will get to sleep WOOHOOO!! That means tomorrow we can go do something fun since it will be our last weekend before the chaos of getting ready to leave starts. Speaking of leaving we have now pushed it off until the 15th. JT came home from school and was the top Accelerated Reader in his class. I am so proud of that little kid. He is sooo smart, it just amazes me. He is now reading on a 5th-6th grade level they say. Anyways, for being one of the top, he gets to go on a trip to Atlanta with the other top readers in the school. They are going to the aquarium and doing a behind the scenes tour. Soooo, I had to put leaving off a day. Now we will leave here in the afternoon and drive up to Atlanta and pick him up at the aquarium before they head home. Then off to St Louis for a few hours rest. Then off we head to Rapid City, SD. Then HOME WOOOHOOO!!! I am sooo excited to be going home. I am still debating on when to come home. I am thinking I will just play it by ear and just come home when I feel like it LOL. Other news Hmmm...Oh yes I GET MY NEW CAMERA WOOHOOO!!! Soooo I will be putting all sorts of pictures on here soon. WOOHOOO!!! !